At heart I am all about the cheap eat. While I’d never say no to a meal at the Gavroche (set lunch = excellent value considering the quality of the food, plus it includes half a bottle of beautiful wine) – I am never happier than when I’m eating something delicious that costs a tenner or less. Simple things done well – that is a t-shirt I’d wear, along with Team Aniston, and one with a picture of Alec Baldwin’s face on it. I love Alec Baldwin so bad it hurts, but more of that in my second novel. This is probably my favourite restaurant in London. It is totally cheap and cheerful, hard to spend more than about £15 a head even if you’re being a total pig (it’s BYO) – but most importantly the food is outstanding. I once saw the Prime Minister here, but don’t hold that against the place if you’re not a fan. Starters: – Fish Cakes, Papaya Salad – super super spicy, not for the faint hearted. Mains: – Gaeng Penang chicken – a really thick, hot red coconutty curry with lime leaves and fresh chillies, again super spicy and addictive. Pad See Ew – stir fried broad rice noodles with eggs and green vegetables in a thick soy sauce. A perfect combination of soft, crunch, salt, almost sweet and above all tasty. Coconut rice – sets off the spicy chicken curry perfectly. Most people love St John because of the whole nose to tail eating thing. They rave about the trotters, or whisper sweet nothings about chewing on a pig’s ear. Well I’ll admit it. I’m scared of offal. I do like liver, but anything more adventurous and I fold. 1. The custard donut of the Gods. They used to serve these at the Spitalfields branch during a brief window, only on a Sunday morning. Now they serve them at their Bermondsey bakery, only on a Saturday morning. When I first ate one of these donuts I became obsessed. 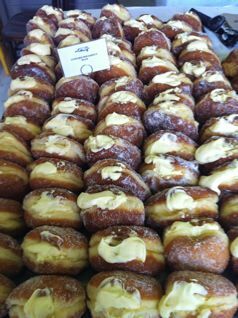 Thick, dense, Madagascan vanilla custard, injected into the crispest, lightest donut casing. If I ever become really rich and move to the South of France, I will, like Elvis with his peanut butter, bacon and banana sandwiches at the Colorado Mine Company, fly myself back on my private jet to London just for a taste of one of these. 2. Welsh Rarebit. The opposite of adventurous I know. But really really great Welsh Rarebit. Goes back to A Simple Thing Done Well. It helps that St John make some of the finest bread in London. On top of their white sandwich loaf they put a combination of Neal’s Yard Montgomery cheddar, Guinness, Lea & Perrins, Coleman’s mustard and a touch of cayenne. Savoury, salty, tangy, melting perfection. *St John’s main menu is not cheap at all, but either of the above two options, fortunately, are. This is the sort of place I’d walk straight past if I didn’t know not to. It’s garishly lit, in a crappy alley in Soho, and shows no indication of its greatness – other than an occasional queue. A word of warning – do not let them seat you in the basement if you have a sensitive nose and don’t like the smell of toilets. The greatest dish on the menu is the Singapore Laksa – by far the best of its kind I’ve had in London. A spicy coconut milk broth, with chunks of chicken, prawn, tofu, noodles and other floating wonders – it is a truly satisfying one-bowl soup meal. Some folk struggle to finish the generous portion but not for want of trying. < Previous Hawksmoor – how do I love thee, let me count the ways….